“What is your favourite cuisine” asked my colleague the other evening. I had a confession to make; my favourite cuisine is Italian, more specifically a good old pizza. 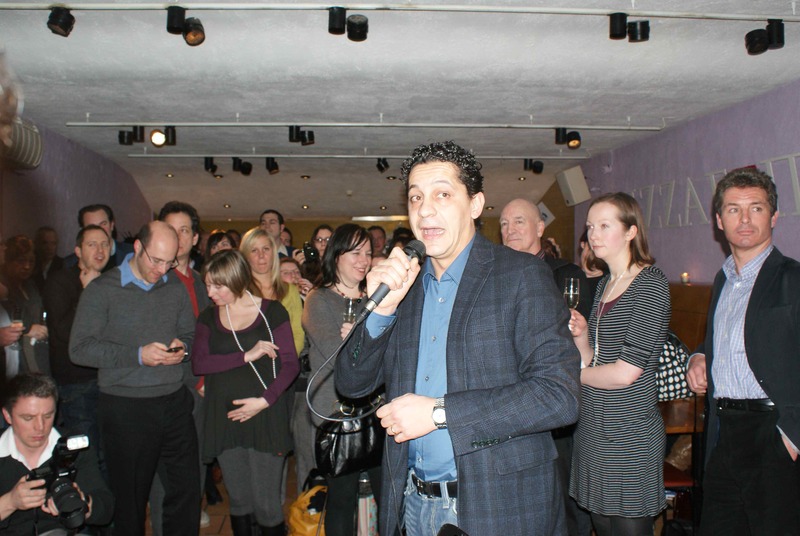 Ironically, the next day I was delighted to receive an invite to the new Francesco Mazzei (L’Anima) range launching at pizza express this week. Pizza Express was a real treat when I was a child growing up in my hometown of Nottingham but having lived in London for 4 years, I have grown to realize that there are a plethora of Italian restaurants serving fantastic pizza so I no long rely on establishments like Pizza Express to satisfy my needs. The original menu also doesn’t particularly contain my favourite flavour combinations so it is refreshing to see their recent celebrity chef collaborations. The evening’s affair was bustling, the wine and fizz flowing and the new Francesco Mazzei range doing the rounds, which consists of two starters, Insalata Semplice and Tricolore and four mains, Mia Sofia, Calabrese, Rustichella and Tagliolini Funghi. Unfortunately the only dish that we didn’t get to sample was the Tagliolini Funghi but this did not dampen my spirits, after all I am a pizza lover at heart. 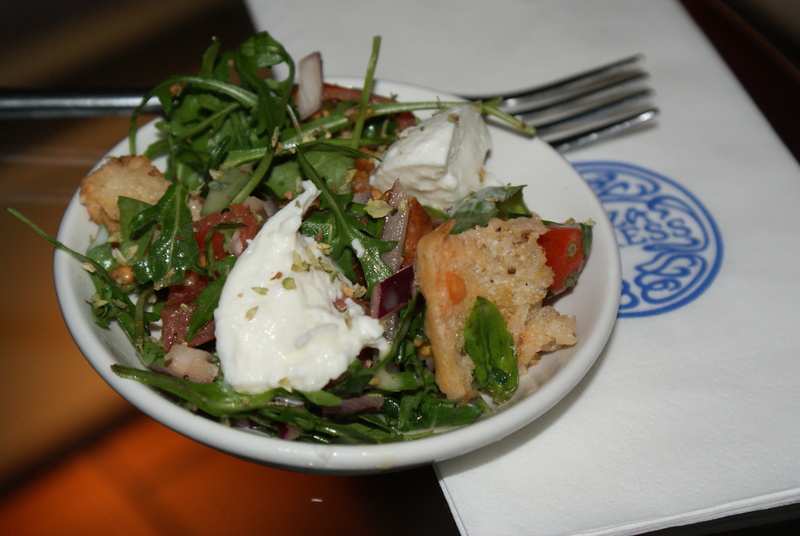 I started with the Insalata Semplice, a delicious blend of Santos and vine tomatoes, fresh rocket, gooey buffalo mozzarella and toasted ciabatta topped with Francesco’s own Calabrian dressing. Up next was Francesco’s take on the classic Tricolore salad, only it took the form of mini bite sized pizza dough slices with spicy guacamole, sun blushed tomato and buffalo mozzarella. The starters delighted the taste buds and I eagerly awaited the mains. The three pizzas on the menu were plentiful. Mia Sofia, named after Francesco’s two year old daughter who loves truffles (expensive taste already!) has a great mild truffle paste, portobello, button and oyster mushroom topping with oregano and garlic on a romana base. Rustichella was brought alive with a Ceasar dressing, pancetta, roasted tomatoes, fresh rocket and topped with grana padano. Last but certainly not least was the mouth wateringly, taste bud exploding, fiery, eye popping Calabrese. The spicy Salsiccia Calabrese DOP sausage, fresh green chillies, roquito peppers, spicy soft n’duja sausage, watercress dressed with pesto, fior di latte mozzarella and oregano is enough to send you reaching for a nice cool glass of water. 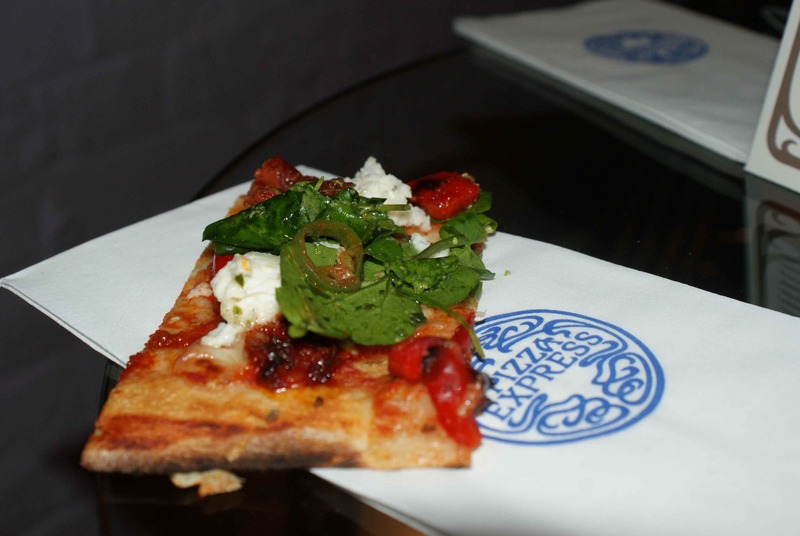 This is the hottest pizza that Pizza Express has ever served and it must be known that this is certainly not for the faint hearted. A few mouthfuls and my mouth was stinging for a good ten minutes afterward. I like a bit of spice but I’m rather a softy when it comes to mega spice. I gave the rest of my slice to Jack and slipped off to find another slice of the Mia Sofia. 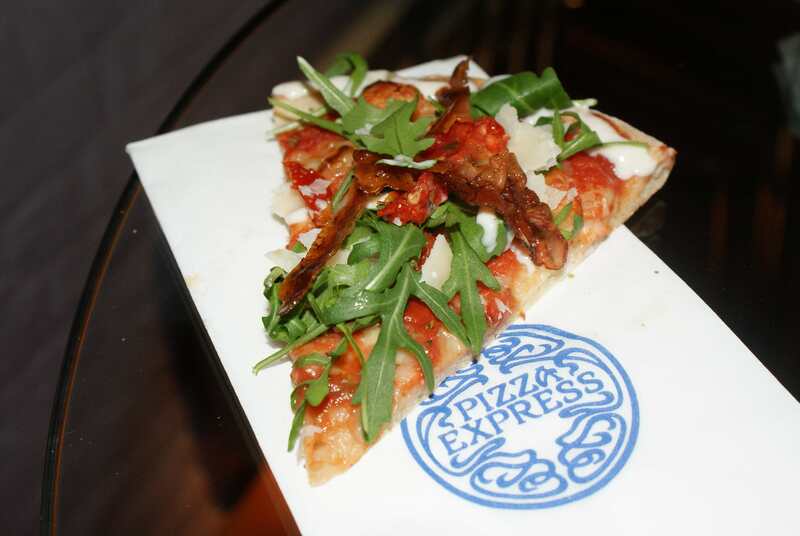 Francesco has brought 14 new ingredients to Pizza Express, most of which have a strong link to Calabria, a small Southern Italian town where he grew up. Salsiccia Calabrese DOP comes from locally-raised hogs. Cumin, black pepper, red pepper and chilli pepper flavourings are added to the meat, which is then aged. New additions also include the Oro Verde olive oil that is used at Francesco’s restaurant L’Anima and Calabrese oregano. The evening ended with a goody bag including a bottle of the Oro Verde olive oil amongst other spicy ingredients and a £20 gift voucher, meaning that we can go back and sample the menu in a restaurant environment. I’m very much looking forward to having a whole pizza myself, although I’m not sure which one I’ll choose!